Note: Also, check out my review of VS Excitebite! Also, if you’re interested in other BS games, check out BS Legend of Zelda and Ancient Stone Tablets! *All images of the game and gameplay were taken by me, not pulled from the Internet. I played the game on a standard U.S. SNES console using SVideo hookups (the best avaliable for the system). I played the game on a 32 inch HD tv. Jumping stacked ghosts in the bonus game is a great way to rack up your Grand Total Score. Quick History: BS Excitebike was a Japan-exclusive game released in 1997. The game was not issued as a stand-alone game cartridge, however. It was made avaliable through the Broadcast Satellaview, a device that plugged into a Super Famicom (Japanese SNES) and allowed game downloads and simultaneous streaming satellite radio. There were actually 4 versions of BS Excitebike that were avaliable for download at differnt times back in 1997, with each one differing slightly from the others. Differences primarily included different track layouts and character choices. This review is technically for BS Excitebike, Mario Battle Stadium 4, as it was the last of the 4 original versions of the downloadable game. Due to the wonders of the Internet, the rom of BS Excitebike 4 can now be put onto an SNES cartridge and played as a traditional SNES game. Gameplay: BS Excitebike is a motorbike racing game starring Nintendo’s beloved Mario characters. If you’ve ever played the NES classic ‘Excitebike,’ then yes, this game is extraordinarily similiar (yet, having played both, I prefer BS Excitebike). Assuming, however, that you have never played the original NES Excitebike, here is a summation – Essentially, after choosing your character, you drive your motorbike to the right as fast as possible, weaving among four lanes to avoid obstacles, drive up ramps, and race over on-track structures. Depending on the type of race (more on this in a bit), you are required to finish a set number of laps or finish as many laps as possible in a set amount of time. Apart from the control pad and Start button, the game only requires two buttons: B and Y. B allows your motorbike to hum along at a steady pace; Y allows for ‘turbo’ mode, wherein your bike speeds along at a faster clip, but can overheat and stall out (costing you time) if held for too long without switching back to the normal (button B) pace. The control is perfect, and handling your character is never a problem. 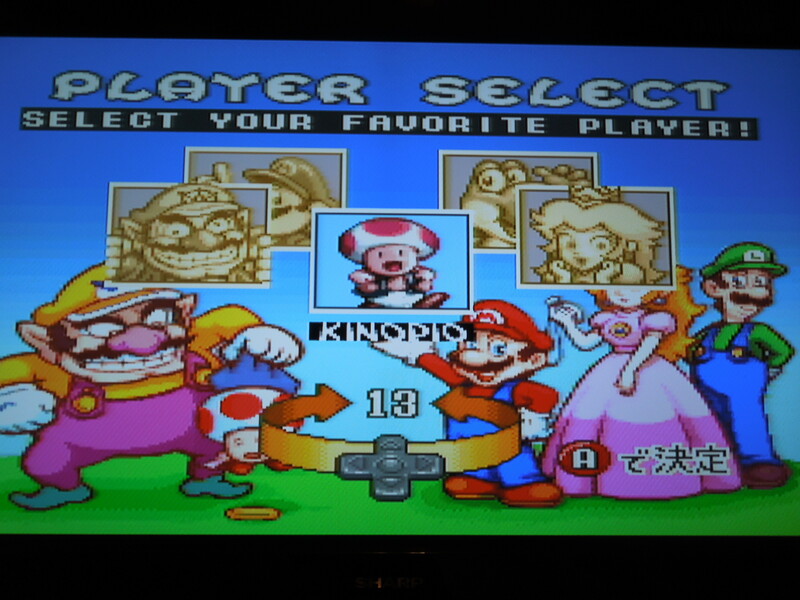 Character Selection: BS Excitebike allows you to choose among 5 motorbike drivers: Mario, Peach, Wario, Yoshi, and Toad (called ‘Kinopio in this game). *Remember, there were 4 versions of this game originally avaliable for the Brodcast Satellaview system, and the characters changed somewhat from version to version. This is why, for example, you may see a video of BS Excitebike that has Luigi as a selectable character, although he is not avaliable in this version. I have played through the game with all 5 characters and have noticed no discernable difference in the speed or handling of the characters, unlike say, Super Mario Kart. Hence, choosing a character becomes only a matter of personal preference. Each character does, however, have their own sound bite that fits the characters perfectly and gives the game that ‘Nintendo’ feel. Mario, for example, issues a ‘Wahoooo!’ The sound bites kick in whenever a character drives up a ramp. Sound and Music: As far as sound effects go, there are only a few in the game, but they work well with gameplay. The sound bite from your chosen driver when he or she hits a ramp, the hum of the bike engine, the warning of a quickly overheating engine, the ‘wrecking’ sound of colliding motorbikes – all of these are appropriate and similiar to what you would have heard if you ever played the original Excitebike for the NES. There is, however, no in game music UNLESS you collect at least 5 coins that are dispersed along the track. 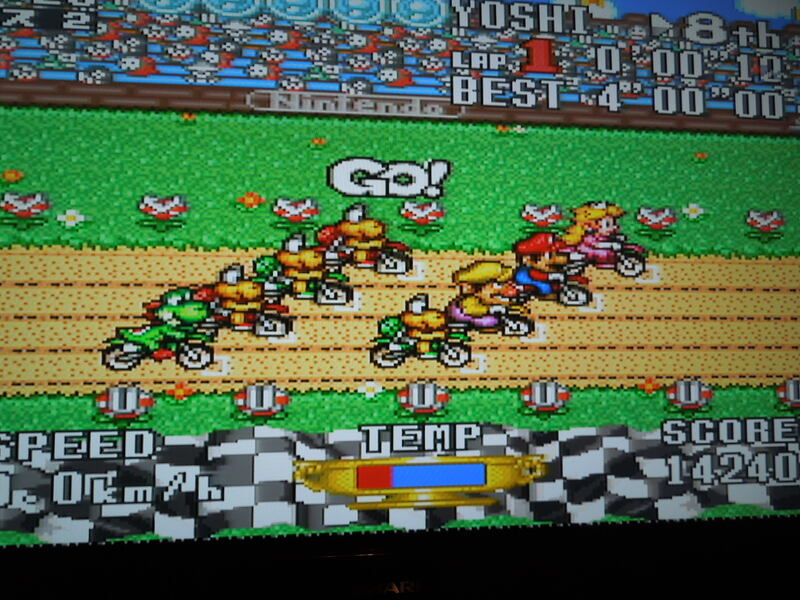 When you collect 5 coins, an upbeat (though repetitive) song will play for so long as you do not wreck your bike. Wreck your bike while the music plays, and the music stops (until you collect 5 coins again). Graphics: Everything looks great – quite vibrant and colorful are the characters, backgrounds, and courses. How the game works: Games that were made for the Broadcast Satellaview in Japan, though many are now avaliable as SNES cartridges, don’t exactly play the way you expect a traditional SNES game to play. Orignally, the downloadable games were supposed to be played in a set amount of time, often times, 1 hour, give or take. 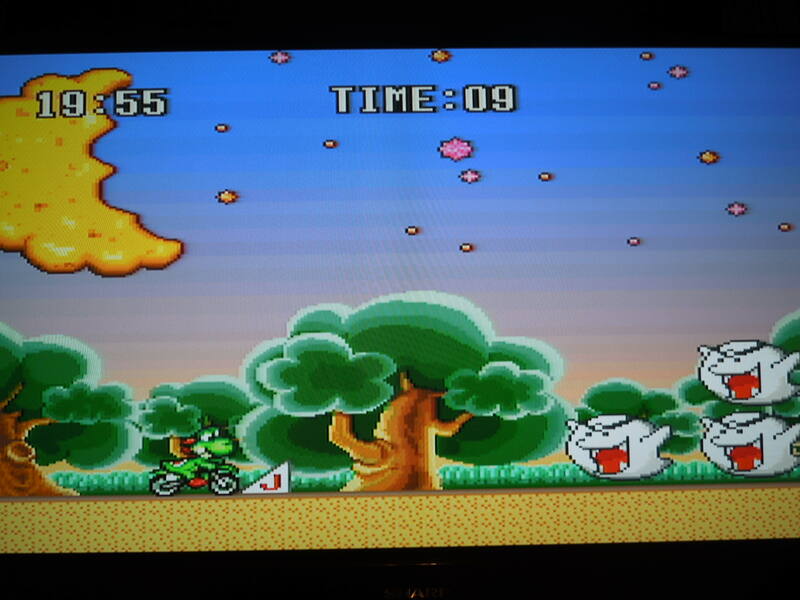 When you boot up your cartridge of BS Excitebike, you’ll notice a timer in the top left corner of the screen set at 19:03. The timer will run until it reaches 19:56, effectively ending the game as the credits roll. In the 53 minutes you have to play the game, the goal was (and is) to get as high of a score as you can in your hour. Finishing first in the Course Races brings in big points toward your grand total. During your hour of play time, after choosing your driver, there are four courses that you will race. For each of the four courses, you must first race in a ‘Qualifying Round’ with just your driver on the track, followed by the actual ‘Race’ against 7 other drivers (Koopa Troopa turtles make up some of the other drivers, although they’re not selectable). So, the format of the game is essentially: Course 1 Qualifying, Course 1 Race. Course 2 Qualifying, Course 2 Race. And so on. Each Qualifying Round is approximately 4 minutes long, and you get points for every lap you finish, every coin you collect along the track, and bonus points for finding Golden Mario Statues (placed at random spots along the track – when you ride over one of these hidden spots, the golden statue will pop out of the ground). After Qualifiying, you participate in the Race, in which you must complete 5 laps in a 4 minute period. The order in which you finish nets you a set number of points, so trying to finish first, which is challenging, is the goal. After each course (both the Qualifying and the Race), you are shown a results screen that tallies all of your points before sending you to the next Course number (your points total carries over through all 4 courses for a grand total at the end of the game). 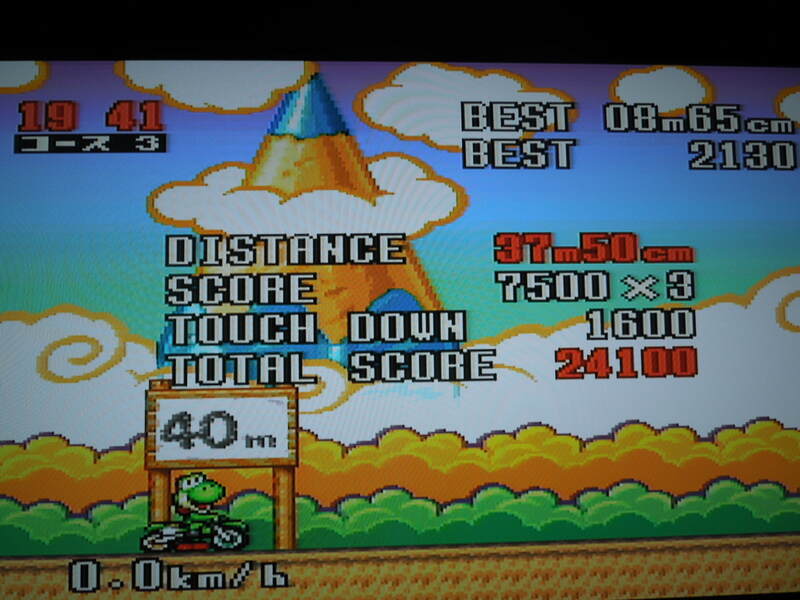 The further you can jump your bike in this bonus game, the more points for your grand total. In between some of the Qualifying Rounds and Race Rounds, or between some courses, there are 2 short bonus games (around 2 minutes long) that can net you more points to add to your grand total. One is a long jump type game, where the further you can jump your motorbike, the higher the number of bonus points you’ll receive. You get as many chances as you have time for, but you only get points based on your best jump. The other is a ‘ghost jump’ game, where the greater number of stacked ghosts you jump, the more bonus points you’ll receive. 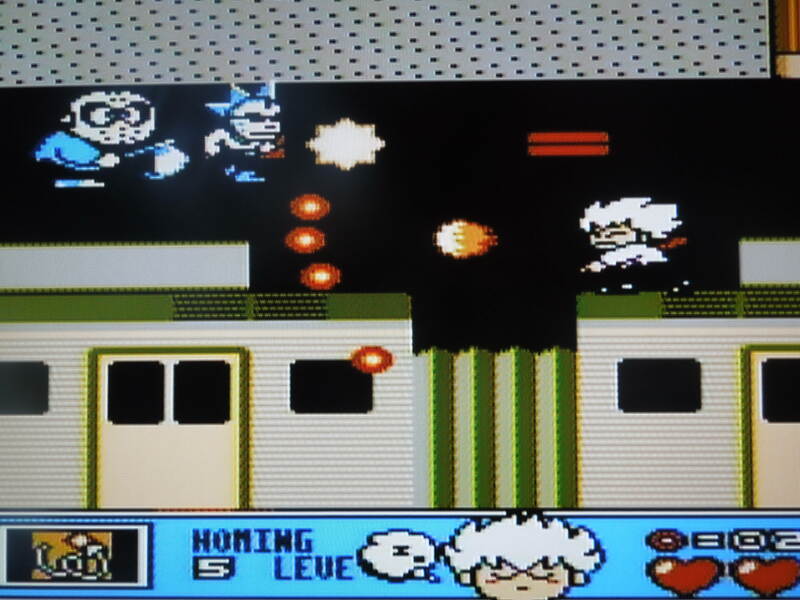 In the ghost jump game, it is important to press ‘Start’ after you finish each set, so as to quickly restart and have the opportunity to jump more ghosts for even more points. After finishing all 4 courses and all of the bonus games, when the timer is at 19:56, you’ll be presented with your final results screen, which tallies up all of your points and shows your Grand Total. Remember, this is a game that is all about getting (and beating) your high score. My current high score is 449, 220 with Peach. Unfortunately, the game cartridge doesn’t save high scores, so it’s up to you to go with the old dry erase board method – it’s more reliable than an old game battery, anyway. A couple of short ending screens will be displayed and the credits roll after your grand total screen, and that’s it. Pausing the Game: Because this cartridge is based off of a Broadcast Satellaview game, you cannot Pause the game. Yes, this can be bothersome, so just make sure you won’t have to be interrupted before you start playing. You can, however, use the Start Button, but beware, if you press Start during a Qualifying Round or a Race Round, the round will end and the clock will skip forward; you won’t get to earn points for finishing laps Qualifying, and you’ll be disqualified from the Race and won’t earn any points. Times to use the Start button include: at the beginning of the game to skip the Demo screen, when the screen of the Princess holding a sign appears, and during the bonus games (as soon as you finish jumping your bike) to give yourself as many chances as possible to get points. After each of the 4 courses are complete, you get this results screen. Language Barrier? If you see images or videos of the game, you’ll notice both English and Japanese in-game text. This in no way affects the playability of this game, nor your understanding of how your score is totaled. There appears to be more English than Japanese on the whole. Powering Up: Collecting coins adds to your total score, but more imporantly, it allows you to use the Y button (turbo) without fear of overheating your motorbike. 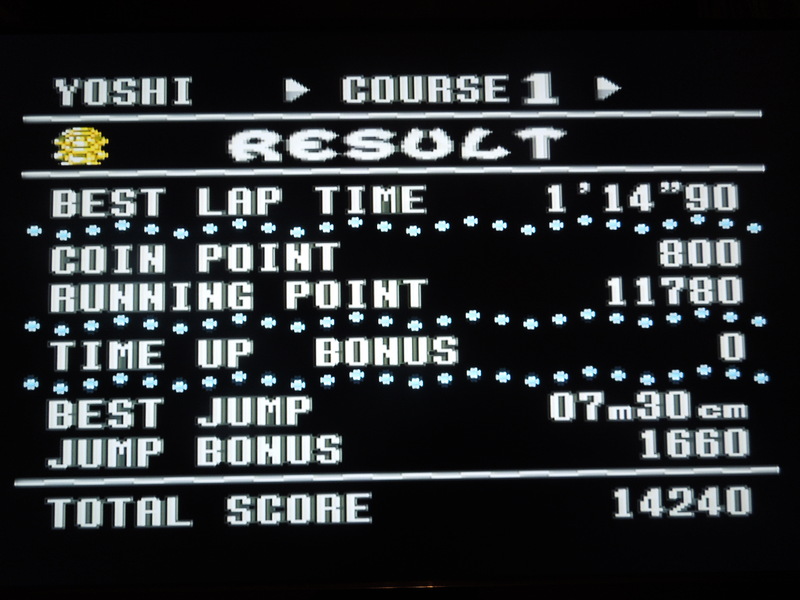 When you collect 5 or more coins on a Course track, music plays, and your character starts flashing (much like when you get a ‘Star’ in Super Mario World for SNES). You are not, however, invincible, as you would be in SMW, so don’t try to wreck other drivers by driving into them because it won’t work! Remember, if you wreck your bike, you lose your ‘power up,’ the music stops playing, and you have to collect 5 more coins to get powered up again! 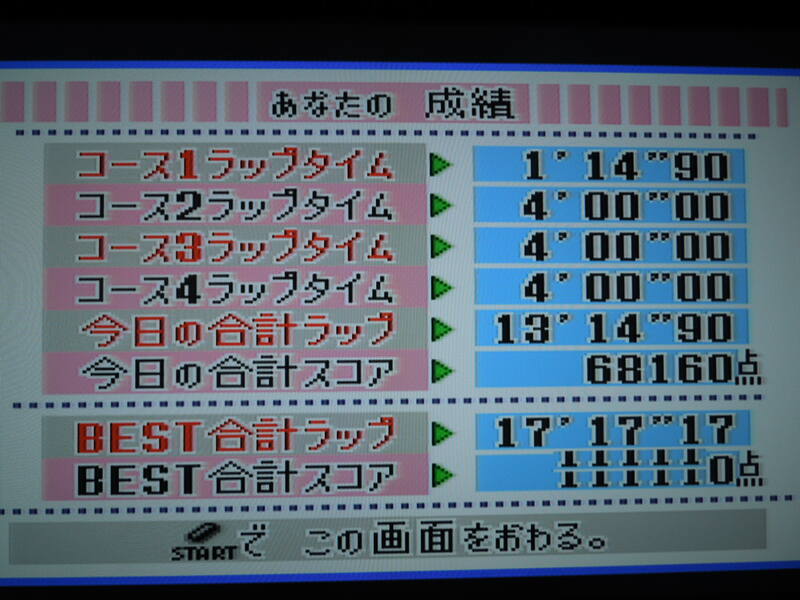 The Grand Total Screen, unlike the individual Course Results Screen, is in Japanese. No worries, though. Your final total is the 3rd line from the bottom. Write it down! Where can I find this game? It’s avaliable as a rom on the Internet for play on an emulator on your computer. I personally do not enjoy playing games this way, but many do, and you can always find the rom by doing a google search of rom websites. Additionally, there are SNES reproduction cartridge websites that can put the game on a cartridge for you or even sell it on their websites. Again, just google ‘SNES repros’ or something similiar. This, to me, is the best way to play the game. Reproduction cartridge websites cannot (or aren’t supposed to, I believe) make and sell any games that were ever released in the North American region, but games such as this one that were never avaliable here can legally be sold (according to what I’ve read, mind you, but you can always research the topic yourself if you’re interested). Conclusion: BS Excitebike is a wonderful and addictive game, particularly if you enjoy trying to best your own high score. It is a shame that it was never released as a stand-alone SNES cartridge back in the 1990s, or that the Broadcast Satellaview was never made avaliable here in the U.S. With some additions like split-screen multiplayer or design-your-own course, it surely would have been a winner. But a gem of a game indeed is this, from great control, to fun and entertaining graphics, to just a boatload of fun altogether. 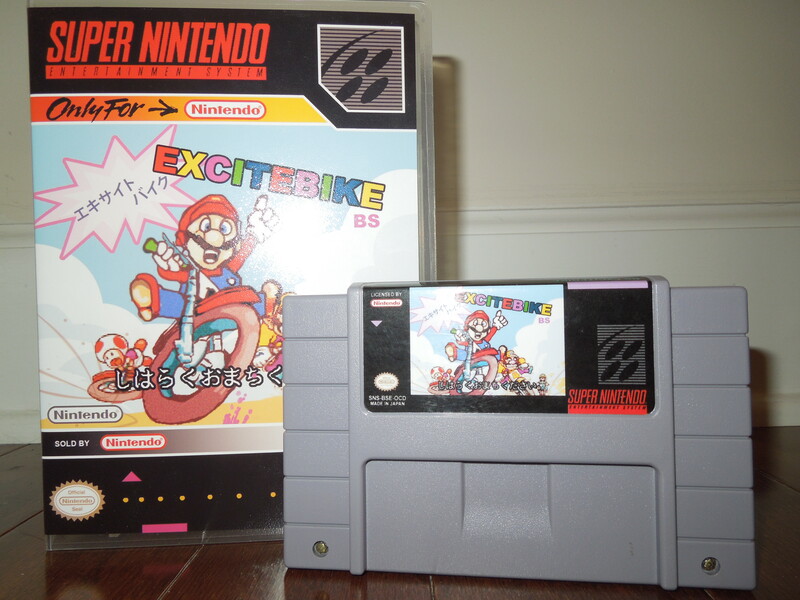 This entry was posted in SNES - BS Excitebike and tagged BS Excitebike Review (SNES). Bookmark the permalink.